Millions of people suffer from anxiety disorders and depression. Anxiety and depression can occur together and can happen at any age. It is believed that a chemical imbalance in the brain is responsible for the development of depression and anxiety. Life stresses, certain health conditions and hormonal imbalances can all contribute to the development of anxiety and depression disorders. Symptoms of depression include persistent sadness or anxiety (lasting more than a few weeks), feelings of guilt, hopelessness, an inability to enjoy activities or hobbies, changes in weight, insomnia and fatigue. Symptoms of anxiety include persistent worry, restlessness, sweating, irritability, fatigue and insomnia. Many people take prescription antidepressant and anti-anxiety drugs to treat their depression symptoms. However, these medications often have undesirable side effects, which include increased thoughts of suicide, weight gain, loss of libido, impotence or insomnia. 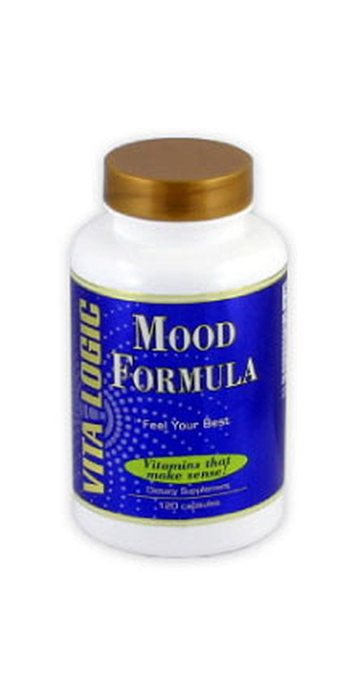 Mood formula by Vitalogic Vitamins is a safe, natural supplement that supports improved mood and lower anxiety levels without harsh side effects. St. John’s Wort (Hypericum perforatum) has recently been shown to be an effective alternative treatment for mild to moderate depression1. The mechanism by which St. John’s Wort works is still unclear, but St. John’s Wort is believed to inhibit the re-uptake of serotonin, similar to many popular prescription antidepressants. The effectiveness of using St. John’s wort for major depression is still unclear2. In Germany, St. John’s wort is the most prescribed anti-depressant and has been an approved herb for depression since 19842. SAM (S-Adenosyl methionine). SAM is sold as a supplement under the name SAM-e (“sam ee”). Controlled trials have found SAM-e to be more efficacious than placebo and equal in efficacy to the tricyclic antidepressants for treating major depressive disorder when administered either intravenously or intramuscularly3. Less evidence supports the use of orally administered SAM-e (as a supplement), although some trials have shown its efficacy as well3. 5-HTP (Hydroxy-Tryptophan) is a precursor of the neurotransmitter serotonin. Many anti-depressants and anti-anxiety medications work by increasing the availability of serotonin in the brain. By increasing the levels of 5-HTP, the synthesis of serotonin could potentially be increased. 1. Linde, K., Ramirez, G., Mulrow, C.D., Pauls, A., Weidenhammer, W. and Melchart, D. (1996) St John’s wort for depression—an overview and meta-analysis of randomised clinical trials. BMJ 313, 253-258. 2. PDF: Lawvere, S. and Mahoney, M.C. (2005) St. John’s Wort. Am Fam Physician (aafp.org). 3. Papakostas, G. (2009) Evidence for S-Adenosyl-L-Methionine (SAM-e) for the Treatment of Major Depressive Disorder. J. Clin. Psych. 70, 18-22. Please note: This product has a strong smell due to the Valerian root extract. Suggested Use: As a dietary supplement, take one (1) capsule twice daily or as recommended by a health care professional. Do not take this natural depression treatment if you are taking birth control pills.